I’m feeling a little nostalgic today. So I thought we might take a little trip down memory lane. Our journey today will take us to a time that honestly many people wish they forgot. The 80’s, a time that’s known for it’s ridiculous hair styles, horrendous fashion, and mostly bad music. However, the 80’s weren’t all bad, at least they had trucks. In remembering 80’s pickup trucks i recall that they weren’t all pretty, but they did what trucks are supposed to do, take a beating, hauled cargo, and took you down roads cars simply could not. Lets start with a pickup that wasn’t exactly a pickup. 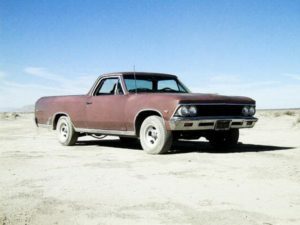 The ever popular El Camino. This little pickup was more for speed than ruggedness. Its platform was based off of a Monte Carlo. They sat low to the ground and most had powerful V8 engines. Although they couldn’t haul a lot of cargo, they sure were able to haul booty. You can’t have any list about pickups without including one of the most popular series of trucks in the world. The Ford F-Series. The 80’s brought big changes for the F-series pickups. With a bigger body and improved chassis, it was the first time since 1965 that the trucks had a complete ground up redesign. The exterior of the truck was also changed to make them more aero dynamic and more fuel efficient. Ford also dropped the M series engines (5.8L, 351M and 6.6L, 400 C.I. V8’s) and added the 5.8L, 351 Windsor and 4.2L, 255 C.I. V8 engines. Here’s a name that many people don’t remember, Datsun. For those of you who are unfamiliar with Datsun, they’re now known as Nissan. The 80’s may have been the end of the Datsun name sake, but before they made the switch they brought us the Datsun 720. The 720 was a tough little compact pickup, and was one of the first models to roll of the line of the newly built plant in Smyrna, TN.